“The floodgates are open” – had me in fits of giggles, and I abandoned all hope of returning to sleep. 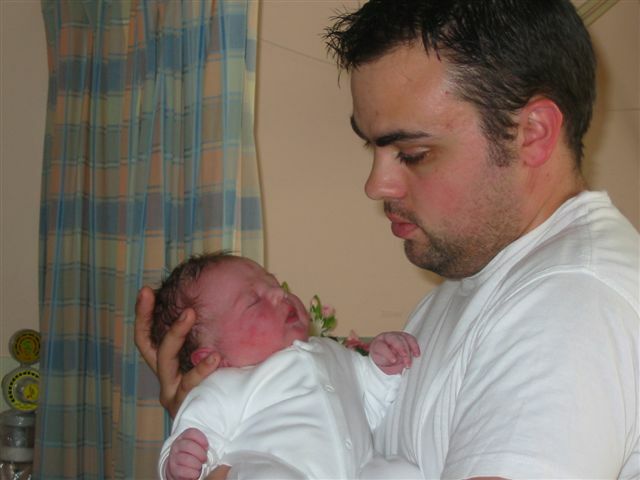 It was a bittersweet moment – of course, the excitement and exhilaration of Simon H and Lucy having their baby was amazing, but it was coupled with an immense sense of loss as my ?5 bet on a Monday birth had been found wanting. I paced around Michelle’s house, wondering when I was going to get a call, wondering if I would get a visit in before I went back home. Thirty minutes later, I was still pacing. No news, I hoped, was good news, so I pottered off to the gym for an hour. I came back. Still no news. Then, at 2.30pm, Jac phoned. “JAMES HUNTER!” he exclaimed, and I breathed a sigh of relief, slumped back in my chair and resumed playing with my newly-acquired XBOX. The war must be on – my dad hasn’t left the chair in front of the television since 7am this morning. A different perspective from the usual dramatic TV news is an Iraqi weblog from inside Baghdad. “Raed” writes an online diary, and updates it whenever he can dodge the bombs. Visit his website – “Where is Raed ?“. Well, it looks like we’re officially moving house. i came home tonight to a barely furnished house. Well, I thought, better sit down and watch some television. Ah. No chairs. I’ll play on my computer then. No chair.